Toyology is a booming local toy store company with multiple locations and plans for several more. Their online presence was there, but limited both functionally and visually by the platform that they were currently built on. 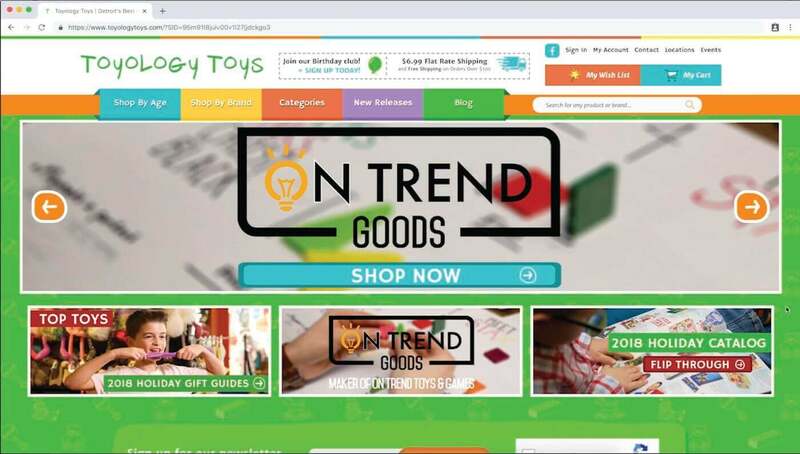 TM worked with Toyology over the course of a year to brainstorm, plan and determine how to bring them into the modern web era - without causing issues with Lightspeed Retail, their retail store system. Needing to move Toyology’s website to a new platform, we had to ensure there would not be any hiccups or mismatched information between inventory in their online store versus each retail locations. As we do best, TM constructed a custom connector between Magento and Lightspeed Retail to facilitate seamless communication. Orders, customers, and inventory updates are sent to Lightspeed Retail in real-time so information is up-to-date at all times. A birthday club module where customers can add in the names, birthdays and relations of anyone they choose. The Toyology website will then email them at two specific time intervals ahead of that birthday, with coupons that they can use. It is both a gift from Toyology and a reminder for each of their customers. A gift registry setup that allows individuals to save and procure as many gift registries as they would like -- be it for a wedding, a birthday, or anything in between. On each product page, there is the ability to add an item to an existing gift registry, or create a new gift registry beginning with that current product. A custom MailChimp integration. We've tapped into their API in order to feed some of the information that is received on the Magento end (birthday club names/emails/dates and newsletter signups) into MailChimp so that the client can use his already-configured email templates and system to send mailers out (both automatically for the birthday club, and manually for the newsletter). This Magento build was a beautiful display of both the client’s branding and TM’s capabilities with the platform. By creating a full-page experience that really harnesses the power of the Magento framework, each page allows for custom imagery and content to further provide information to the customer, while basic e-commerce functionalities remain easy to see and use. Constructed a custom connector between Magento and Lightspeed Retail to facilitate seamless communication. Customers can add in the names, birthdays and relations of anyone they choose. With the already-configured email system and branded templates, the client can send birthday club mailers and newsletters out in no time.